Aquatic herbicides can help remove and control weeds in ponds. According to the Southern Regional Aquaculture Center (SRAC), there are three steps in choosing which herbicide to buy: identify which weed you are trying to control, check that the herbicide is labeled for use with food fish and note any water-use restrictions for use in a particular situation on a specific body of water (i.e., swimming, irrigation, livestock watering). 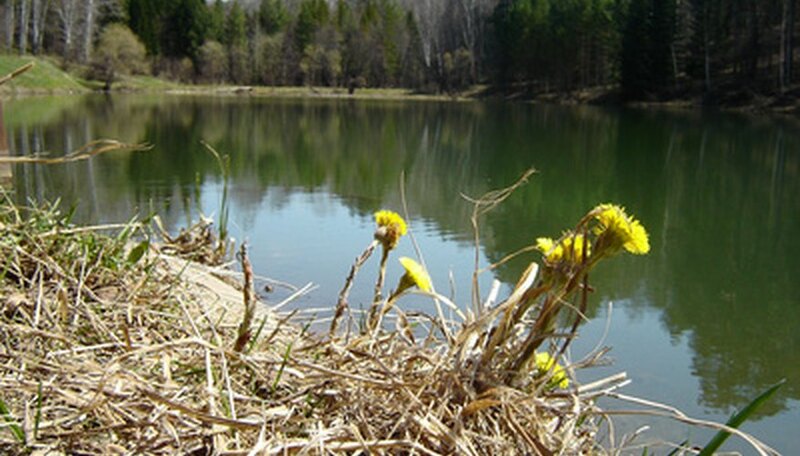 There are many herbicides that can be used in ponds, under the appropriate conditions. Bluestone (copper sulfate) is a contact herbicide used to control algae in ponds. According to SRAC, bluestone can interfere with the gill functions of fish and, if improperly used, be toxic to fish and zooplankton. Koi and trout are especially sensitive to bluestone. Bluestone should be applied in cool months, as its toxicity to fish increases as the water temperature increases. Sonar (brand name of fluridone) controls most submerged and emergent weeds. Available as pellets or liquid, the liquid also controls duckweed and watermeal. Sonar slowly kills plants over a 30- to 90-day period by preventing the depletion of dissolved oxygen. Sonar cannot be used as a spot treatment; you must treat the entire pond to control the weeds. Reward (brand name of diquat) is a contact herbicide that can be sprayed on or injected into sections of a pond. It controls submerged weeds and filamentous algae. It also can be used in spray form to control duckweed and emergent vegetation. You may need several applications to kill surface mats of algae, such as Pithophora. When you use Reward as a foliar application, you will need to add a non-ionic surfactant. Because Reward will bind to clay, it is not very effective on mud-coated weeds or in muddy water.